NOTE: Forecasts for the Pawtuxet River at Cranston are issued as needed during times of high water, but are not routinely available. 22 This is a serious and potentially life threatening flood situation, nearing or exceeding flood levels seen during the historic March 2010 Floods. Follow the directions of local officials if you are asked to evacuate. Do not go sightseeing and stay away from river banks, which can suddenly give way due to erosion and fast moving water. Swiftly moving water can pose an imminent threat to life. Evacuations are likely in Warwick, West Warwick and Cranston. Homes and businesses will be impacted. 20 This is a serious and potentially life threatening flood situation, approaching flood levels seen during the historic March 2010 Floods. Follow the directions of local officials if you are asked to evacuate. Do not go sightseeing and stay away from river banks, which can suddenly give way due to erosion and fast moving water. Swiftly moving water can pose an imminent threat to life. Evacuations are likely in Warwick, West Warwick and Cranston. Homes and businesses will be impacted. 18 This is a serious and potentially life threatening flood situation. Follow the directions of local officials if you are asked to evacuate. Do not go sightseeing and stay away from river banks, which can suddenly give way due to erosion and fast moving water. Swiftly moving water can pose an imminent threat to life. Evacuations are likely in Warwick, West Warwick and Cranston. Homes and businesses will be impacted. 16.5 This is a serious and potentially life threatening flood situation. Follow the directions of local officials if you are asked to evacuate. Do not go sightseeing and stay away from river banks, which can suddenly give way due to erosion and fast moving water. Swiftly moving water can pose an imminent threat to life. Evacuations are likely in Warwick, West Warwick and Cranston. Homes and businesses will be impacted. 14.5 Evacuations are likely near the Pawtuxet river in Warwick and Cranston. Both homes and businesses will be impacted from this flood event. Businesses and homes will be impacted on streets including but not limited to the following, in Warwick, Pioneer Avenue, Bellows Street, Venturi Avenue and River Street. In Cranston, Wellington Avenue and Avery Road. In West Warwick, Daisy Street, the lower ends of Canna, Begonia and Aster Streets, and portions of Providence Street to Route 2. 12 Evacuations are likely near the Pawtuxet River in Warwick and Cranston. Both homes and businesses will be impacted from this flood event. Businesses and homes will be impacted on streets including but not limited to the following, in Warwick, Pioneer Avenue, Bellows Street, Venturi Avenue, and River Street. In Cranston, Wellington Avenue and Avery Road. In West Warwick, Daisy Street, the lower ends of Canna, Begonia and Aster Streets, and portions of Providence Street to Route 2. 11.5 Homes and businesses are impacted in low lying sections of Warwick, West Warwick and Cranston. Affected roads in Cranston include Avery Road and Wellington Avenue. Affected roads in Warwick include Pioneer Avenue, River Street, Bellows Street and Venturi Avenue. In West Warwick, affected areas include Daisy Street and the lower ends of Canna, Begonia and Aster Streets. 11 Structures and homes are impacted in low lying sections of Warwick. Affected areas include homes and businesses on Wellington Avenue and Avery Road in Cranston, as well as Pioneer Avenue, Bellows Street, Venturi Avenue and a portion of River Street in Warwick. 10 Flooding will occur along Pioneer Avenue, Bellows Street and Venturi Avenue in Warwick. Some homes are impacted on Avery Road and Wellington Avenue in Cranston. 9.5 Parking lots and roads are flooded in low lying areas of Warwick and Cranston near the Pawtuxet River. Impacted roads include River Street, Pioneer Avenue, Bellows Street and Venturi Avenue in Warwick. 9 Minor lowland flooding will occur along the river as it flows through Warwick and Cranston. US Geological Survey inundation mapping is available in this location. Visit http://wimcloud.usgs.gov/apps/FIM/FloodInundationMapper.html and click on the "Pawtuxet River at Cranston" circle. 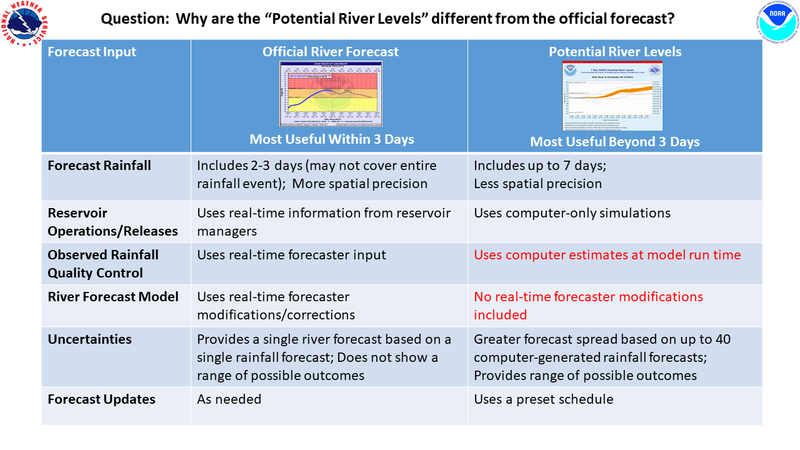 For an explanation of Potential River Levels, see this Fact Sheet.